Do you have the right fire extinguisher handy? I know most of us are not thinking about fire extinguishers for our home. In most offices it is code to keep one up to date and at hand. I feel like these might be out of sight, out of mind until an emergency arises. 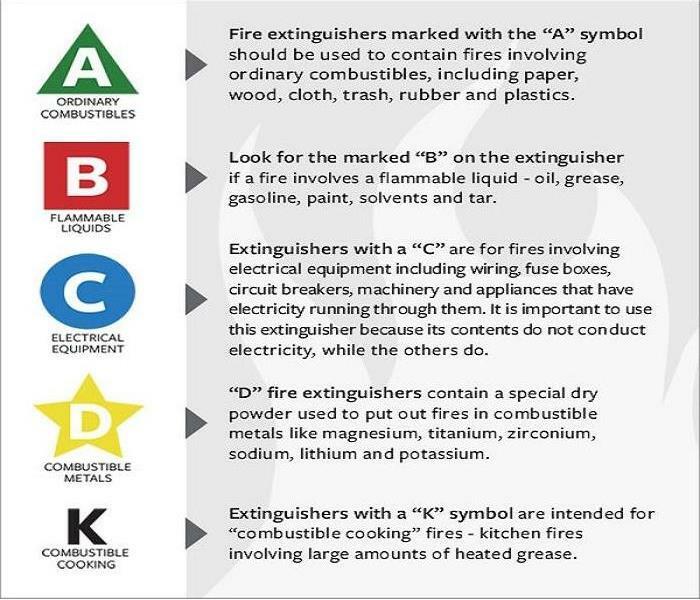 It is important to keep fire extinguishers in your home and office but also equally important to make sure you have the right types of fire extinguishers on hand to put out common household fires. Pull the pin on the fire extinguisher in order to break the tamper seal. If you have been affected by smoke or fire damage in your home or business please give SERVPRO of Guadalupe & Gonzales Counties a call at 830-379-7474. We are here to help. Not all fires are the same. High oxygen: Dry sponges are a must. Follow this by applying a low-alkali detergent and then rinse thoroughly. Low oxygen: Use high-alkali detergents along with warm water to wash the walls and structures. Rinse, then paint over. 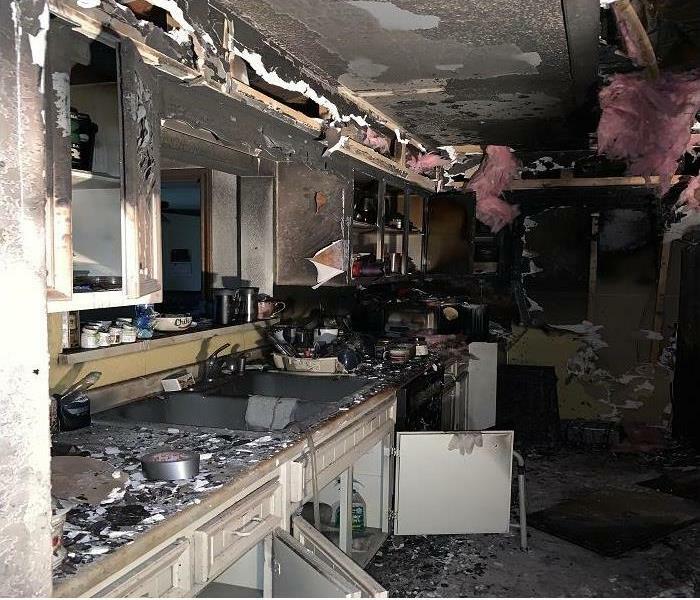 Kitchen: These are often the most challenging fires to clean, as soot residue is difficult to detect. For this reason, cabinets, drawers and other appliances often need to be removed to adequately clean the area. Clothes and fabrics: A specialized dry cleaner is capable of restoring these items to preloss condition. Cleaning soot-contaminated clothing is somewhat of a science, and while a homeowner may be able to adequately restore clothing on his own, it’s always best to leave this to the professionals. Carpet: A professional carpet cleaning is a must in order to effectively remove contaminants and odor from the carpet. A lot of times the carpet must be removed. Building materials: Dry chemical sponges are your best bet for wallboard, plaster, wood and wallpaper. These will remove much of the soot and also prevent it from being lodged deeper into the material. Other materials: Sponges, towels and mops are ideal for cleaning tile, glass, metal and certain appliances. Since these aforementioned objects are less porous than drywall, for example, it’s OK to use a wet or dampened sponge or cleaning tool. Plus, there’s no risk of lodging contaminants deeper into the material. Specialty cleaning tools: Ultrasonic cleaning machines can come in handy as they can adequately clean non-porous items quickly and efficiently, compared to hand cleaning. If your home or building has been affected by fire and/or smoke damage, give SERVPRO of Guadalupe & Gonzales Counties a call at 830-379-7474. We have the equipment and knowledge to get the job done. It’s BBQ time in Texas! Here are some BBQ tips. 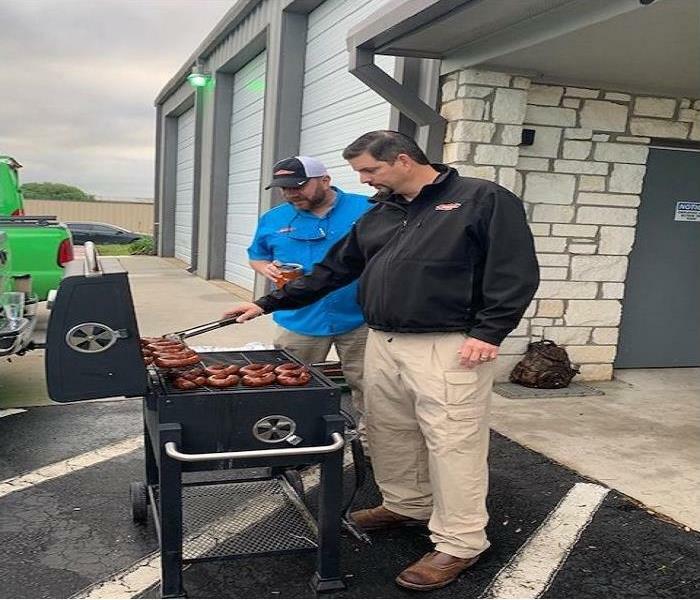 It's BBQ time at SERVPRO of Guadalupe & Gonzales Counties! One single factor causes more than 1,500 home fires every year. BBQ grills! It is BBQ time in Texas and we are grilling at our shop today. Did you know that approximately 17 percent of the estimated 8,900 fires caused by grills every year happen because the cooker is too close to something flammable. Things like deck rails, patio furniture or those fun citronella tiki torches can catch fire if not kept at a safe distance from the grill. The NFPA and the International Code Council (ICC), organizations responsible for developing building codes and standards for fire safety, recommend a distance of at least 10 feet between a grill and any combustible material. Gas and charcoal grills are strictly prohibited on balconies and decks, unless they are connected to a one- or two-family home. Never leave your grill unattended. Keep children and pets at least three fee away from the grill area. Keep your grill placed away from the home, deck railings, and out from under eaves and overhanging branches. If using charcoal, let the coals completely cool before disposing in a metal container. This we have seen first-hand. A client disposed of coals a day after a BBQ in a plastic bucket in the garage. They sparked back up and started a fire in their garage. If your home or business has been affected by fire or smoke damage give SERVPRO of Guadalupe & Gonzales Counties a call at 830-379-7474. We are here to help. Call SERVPRO of Guadalupe & Gonzales Counties for air duct cleaning at 830-379-7474. 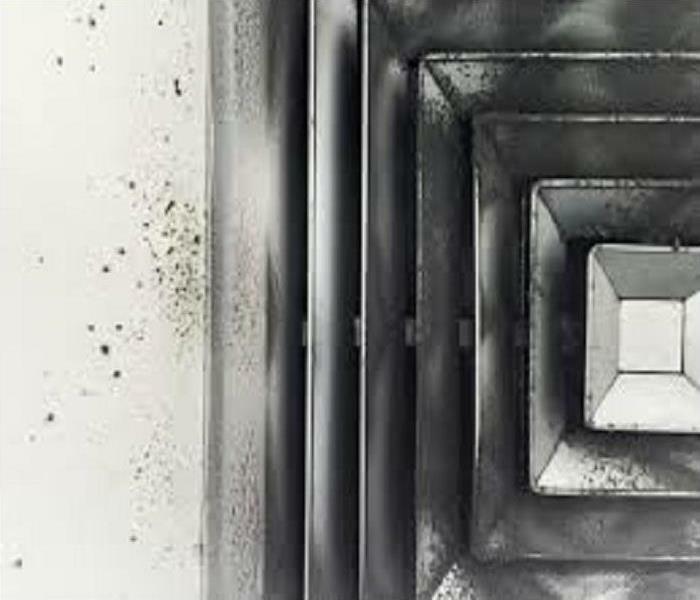 Air ducts are usually something people don’t notice until there is a problem. Things like musty smells, mold or mildew around the registers will get people’s attention. Why wait until something goes wrong? Having a maintenance schedule for your HVAC and ducts is important and a great way to improve air quality and insure that your system is running properly. Our process includes: Using a HEPA filtered vacuum system with a brush head to vacuum out and brush out dust and particles in the duct trunk line. We clean off the vent cover and use a fogger to seal the duct run with a sealant mixed with a deodorizer that will seal in any particles that might be left behind and re-attach the vent cover. We also clean at the air return. However, we do not service or clean the actual HVAC unit. This would need to be cleaned and inspected by a licensed HVAC contractor. If you would like an estimate for duct cleaning, please give SERVPRO of Guadalupe & Gonzales Counties a call at 830-379-7474. We are here to help! It’s a good practice to change the batteries in your smoke alarms and test them in the Spring. I always go by the daylight-saving time weekend to tackle this important task. Every bedroom needs a working smoke alarm. 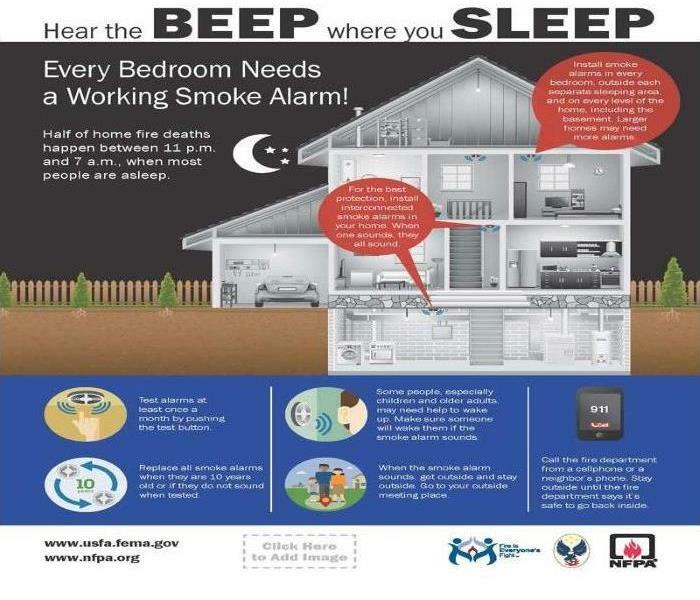 Half of home fire deaths happen between 11:00 p.m. and 7 a.m. when most people are asleep. For the best protection install interconnected smoke alarms in your home. When one sounds, they all will sound. We have this system in our home which is about 6 years old. Older homes may not have but one smoke alarm and usually they are in the kitchen. This will not help if you have a 2-story home and your fire starts on the 2nd level. It’s important to have smoke alarms installed on all levels of your home. Replace all smoke alarms when they are 10 years old or if they do not sound when tested. You can look on the back of the alarm for the date of manufacture. If you have had fire and/or smoke damage in your home or business, please give SERVPRO of Guadalupe & Gonzales Counties a call at 830-379-7474. We are here to help! Call SERVPRO of Guadalupe & Gonzales Counties if your home or business has water or flood damage at 830-379-7474. Call SERVPRO of Guadalupe & Gonzales Counties at 830-379-7474. Our phones are answered 24/7 365 days a year. 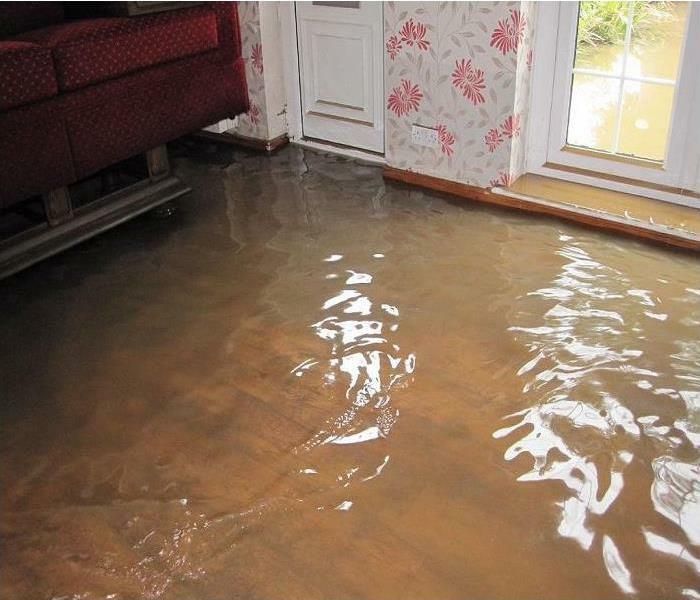 We have staff that is on call for your after-hour water damage emergencies. Call SERVPRO of Guadalupe & Gonzales Counties at 830-379-7474 to get the drying processing started. Document Everything. When thinking about what to do if your house floods, the first thing that probably comes to mind is cleaning up the mess. 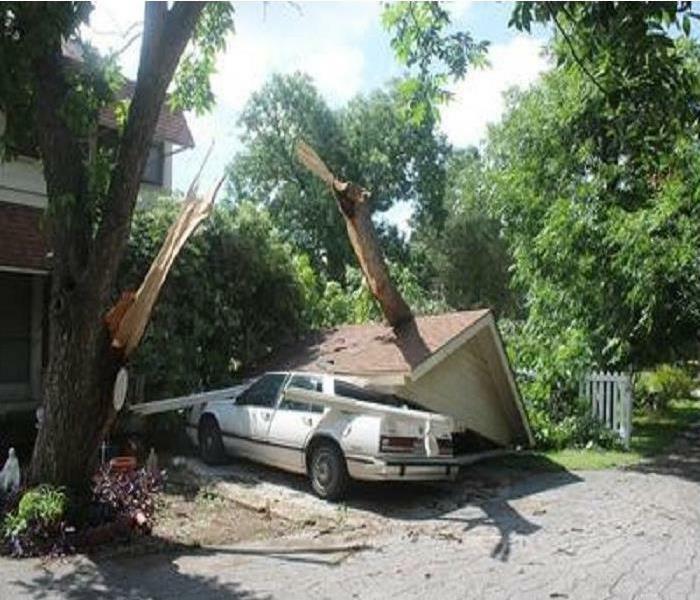 But before you do, document everything so you can show your insurer the extent of the damage. Use your cellphone camera to film or photograph all aspects of the issue. Start the Cleanup Process. Cleaning up after a flood is a long, arduous process. You’ll need to remove the water, salvage any personal items you can, dry the space out, and disinfect any areas or objects the water touched. And, as in the previous step, you’ll need to undertake these tasks while wearing proper safety gear to avoid contact with bacteria. Do you have humidity or moisture problems in your home? 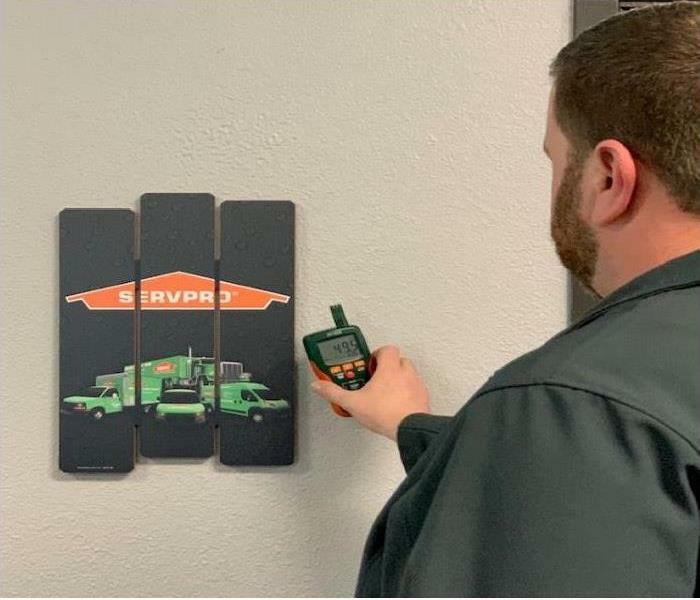 SERVPRO of Guadalupe & Gonzales Counties has the equipment and training to detect your moisture issues. High home humidity can be uncomfortable. Worse yet, it can pose a threat to your home's structure and surfaces causing water damage and/or mold. In Texas our humidity we see a lot of moisture issues in homes. Control moisture that can damage your home's wood, paint, and siding. Prevent mildew growth and odors in clothing and belongings. Improve indoor air quality by reducing dust mites, mold, and other allergens. Improve the energy efficiency of your air conditioner. Invest in a unit with a variable-speed air handler. Consider installing a whole-house dehumidifier. Don't automatically lower the thermostat. Turning down the thermostat to reduce humidity can be a sign of an oversized air conditioning system. If you are using the thermostat, though, smart thermostats can be part of a humidity strategy. Air-conditioning systems can only keep up with the moisture they're designed to remove, whether the systems condition fresh incoming air, recirculating interior air, or both. Select houseplants that absorb moisture from the air, such as Boston ferns. Take measures outside. ENERGY STAR suggests keeping gutters and downspouts clean, extending downspouts further from the house, watering plants only when needed and sloping soil away from foundations to keep water from pooling. Call SERVPRO of Guadalupe & Gonzales Counties at 830-379-7474. We can help determine the source of your moisture issues. We have the equipment and knowledge. Spring cleaning should include your gutters. Clogged gutters can cause water damage to your home or business. In Texas, especially Guadalupe & Gonzales Counties we get all kinds of weather. From hurricanes, tornadoes, hail, high winds, flooding, and even snow! 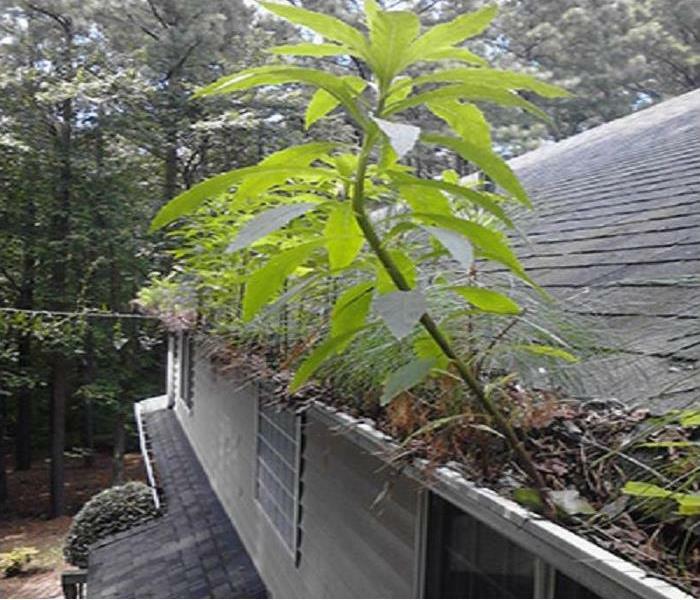 People don't often stop to think of the issues that can arise from clogged gutters, but there are actually many. If water is not able to properly flow away from your house, then damage can result in a number of different locations, from your roofing to your foundation. There are number of reasons to make sure that your gutters get cleaned out. Here is a look at six of those reasons. If your gutters become clogged to the point that water is spilling over the side and into your garden beds, you can damage your plants' health by essentially drowning them. Over-watering can be as harmful as not watering enough. Clogged gutters are holding too much weight, which can result in damage to the brackets. SERVPRO of Guadalupe & Gonzales Counties can help you with your water, fire or mold damage. Give us a call at 830-379-7474. Winter weather related Warnings, Watches and Advisories are issued by your local National Weather Service office. Each office knows the local area and will issue Warnings, Watches or Advisories based on local criteria. 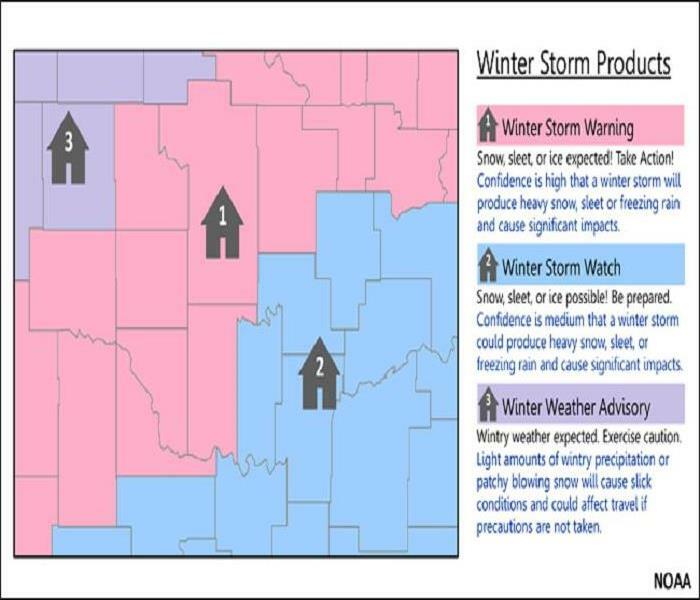 For example, the amount of snow that triggers a “Winter Storm Warning” in the Northern Plains is typically much higher than the amount needed to trigger a “Winter Storm Warning” in the Southeast. Wind Chill: A measure of how cold people feel due to the combined effect of wind and cold temperatures; the Wind chill Index is based on the rate of heat loss from exposed skin. Both cold temperatures and wind remove heat from the body; as the wind speed increases during cold conditions, a body loses heat more quickly. Eventually, the internal body temperature also falls and hypothermia can develop. Animals also feel the effects of wind chill; but inanimate objects, such as vehicles and buildings, do not. They will only cool to the actual air temperature, although much faster during windy conditions. Read how the Wind Chill Index was developed. Bundle up, be prepared and protect people, pets and plants! In the aftermath of a Hurricane like we experienced with Harvey, yards are often covered with fallen trees, broken branches and scattered debris. Post-storm cleanup can present some dangers, so it’s important to take your time and use caution as you clean up the debris. Here are some cleanup and safety tips to help you clean up your yard once the storm passes. Survey the area for damage. Walk around your property to inspect overall damage and take pictures and/or videos as documentation. Check for overhead downed power lines and hanging branches. Treat all downed power lines as if they are energized and call your local electric provider immediately to report the problem. Wear protective gear. Eliminate injuries by dressing appropriately and using protective eyewear and durable gloves. Home damage. If your home or roof is damaged do your best to cover the exposed areas with tarps and plastic. If you are not comfortable getting on the roof call your local roofing company for tarping assistance. If you have had damage to the interior of your home such as debris and water damage, give SERVPRO of Guadalupe & Gonzales Counties at call at 830-379-7474. We are here to help get your home cleaned up and dried out. 4/19/2019 - Do you have the right fire extinguisher handy? 4/18/2019 - Not all fires are the same. 4/18/2019 - It’s BBQ time in Texas! Here are some BBQ tips. 3/13/2019 - Hear the BEEP where you SLEEP! 3/5/2019 - Up to your ankles in water? 3/5/2019 - Do you have humidity or moisture problems in your home? 3/5/2019 - Spring cleaning should include your gutters.